You're one quick scroll-down away from a perfect graphic design resume sample. Better yet? You're a 5-minute read away from learning how to write one yourself. You’re a graphic designer. You’re creative. You’re good. Employers will beat a path to your high-end monitor. You don’t have to worry about your graphic designer resume. Unfortunately, no. There are 286,000 of you. The coolest high-paying jobs will go to the best of the best. Need another reason to craft the best graphic designer resume possible? You’re not unique. To the people who hire graphic designers, you’re just one more for the rejects pile. That’s why your resume needs to stand out like Milton Glaser designed it. 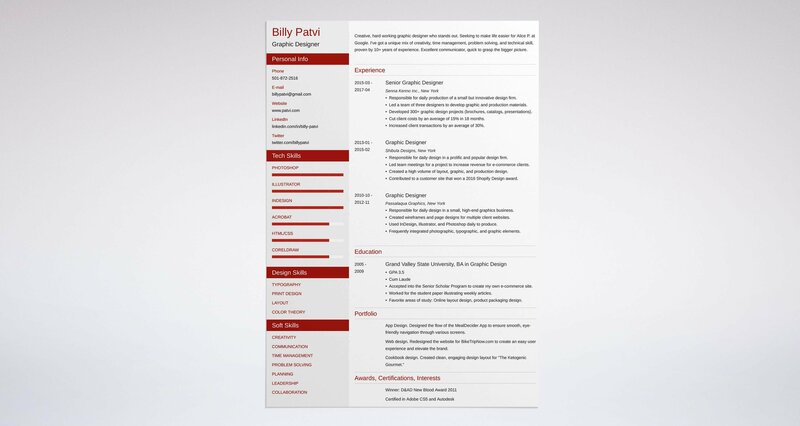 A graphic design resume example better than 9 out of 10 other resumes. How to write a graphic design resume that will land you more interviews. Tips and examples of how to put skills and achievements on a graphic design resume. How to describe your experience on a resume for a graphic designer to get any job you want. 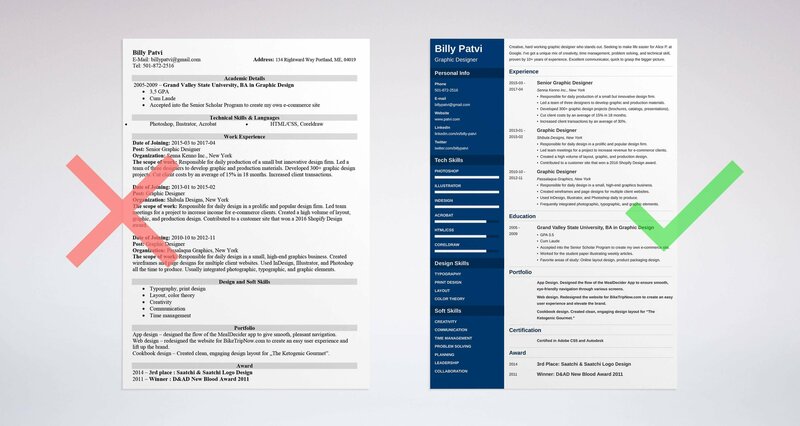 Here's a sample resume for a graphic designer made using our resume builder. What’s the Best Format for a Graphic Designer Resume? You’re a graphic designer, so you need to showcase all your skills with the flashiest resume on earth. Right? Graphic design is all about conveying great content in a pleasing way. Notice that “conveying great content” comes first. Creative graphic design resumes printed on milk cartons or in super-spy dossiers are catchy. But they’re a little too catchy. Job one is to get your great content across without creating extra work for the art director. That art director has about six seconds to check your resume. And there are 286,000 of yous fighting for 266,300 graphic design jobs. That means if your information is buried somewhere in your edgy design... uh-oh, trash bin. Art directors and marketing managers pay close attention to good graphic designer resume layouts. Use white space to give their eyes a rest, and legible fonts to make for easy reading. Next, save the resume as a .pdf. MS Word is great, but the formatting can get borked en route. A .pdf is set in carbonite. Just make sure the company will accept one. Some won’t. Pro Tip: Want to stand out like Banksy? Don’t do it with challenging or overly creative resume ideas. Instead, point your well-designed resume to a stellar online portfolio. See 50 great portfolio examples here. Remember, you are looking for a job and with resumes it is always substance over form. Creativity is fine, but it means less to employers and Applicant Tracking Systems than facts and figures. As a graphics expert, you can’t just use other people’s templates. And, again, don’t self-sabotage your efforts and make sure your graphic designer resume makes your case with its contents not flashy images. You don’t want to be unreachable. Still, your contact info shouldn’t overshadow the rest of your innovative graphic designer resume. Pro tip: For a two-page resume for a graphics designer, put contact info on both pages. Should You Use a Graphic Designer Resume Summary or Resume Objective? Picture an art director. We’ll call her Alice. She’s the gatekeeper of the juiciest graphic design jobs on the West Coast. It’s got nap rooms and free onsite doctors. You really, really want to work for Alice. The best way to get her attention is to start your excellent graphic designer resume with: “Objective: To get a job as a graphic designer.” True? The best way to get Alice’s attention is to say what you can do for her. To do that, use a resume summary if you’ve got lots of experience. Senior graphic designer responsible for daily graphic design content for a medium-sized firm. Worked regularly on graphic, layout, and production materials. Recipient of the 2016 BigCommerce Design award. Developed 200+ graphic design projects (logos, brochures, advertisements, infographics) that increased client transactions by 25%. Graphic design professional with 10+ years experience. Looking for a job as a graphic designer. Skilled at Adobe Illustrator. Use a resume objective if you’re just starting out or changing careers. If you’re just starting out or you’re looking for a new niche, use a resume objective. It drops the “experience” with a focus on skills. Graphic design graduate looking for a job in graphic design. Can use photoshop, illustrator, and CorelDraw. Pro Tip: Avoid examples of generic resume objectives. Go for details, highlight your specific strengths, and fit them to the job offer. Aim for Picasso vs paint-by-numbers. Remember Alice? The art director for the job with the nap rooms and in-house doctors? Experience matters a lot to her. If you don’t present yours in just the right way, chances are she won’t even see it. Statistics show she looks at each resume for only six seconds. Start your original graphic design resume experience section with your most recent job. Then list responsibilities and achievements in bullet points. Tailor your experience to each and every job opening. Custom-tailored resumes pop out like a Dali painting. Let’s take an example job offer. This one is looking for a candidate who can translate the written word into images and layouts. The successful candidate will understand marketing in the retail sector. For our example, let’s imagine you’ve made a list of 112 achievements and responsibilities. For this sample graphic designer resume, you’ll pick only the four that best fit the job offer at hand. Spearheaded daily design in a small but prolific firm. Facilitated team meetings for a project to increase revenue for ecommerce clients. Responsible for daily graphic design. Led team meetings for a project to increase revenue for blog clients. Worked on a project to create logos for a new client. Contributed to a customer site that won a 2016 Best of News Design award. They’re both equally good resume experience examples. It’s just that one is tailored to the job (and will likely land an interview) and one is trash-bound. Anyone can make an eye catching graphic designer resume if the challenge is picking between various prestigious design awards. But what if you have no experience on your resume? You need experience to get experience. It’s like two hands drawing each other. The good thing for graphic designers with no experience is, it’s easy to get some. As a new designer, you can showcase your own work in an online portfolio. You can also enter contests and do one-offs for sites like Freelancer.com, 99 Designs, and CreativeAllies. Or do a couple small jobs cheap for local businesses. Designed logo for Nabor Gro groceries and liquor, Arondale, Connecticut. Received 99 Designs award for best t-shirt design, February, 2017. Designed brochure for Zorbuni, Inc., Des Moines, Iowa. Use action words to make your experience section really pop. Instead of "responsible for," or "worked in," use, "spearheaded," or "contributed to." Get more action word examples in the table below. Pro Tip: Get a Pinterest account, and use it. Pinterest is a great way for graphic designers to showcase their work. Pinterest portfolios can jump start even a student resume. Nothing beats real world experience. So does education really matter, especially on a freelance graphic designer resume? If you don’t have a great degree, you can build experience fast to make up for it. If you’ve got a great degree, it’s a feather in your cap. Either way, you’ll want to show your education in the best light to stand out like Warhol. List things about your schooling that prove you were born and bred to get this job. 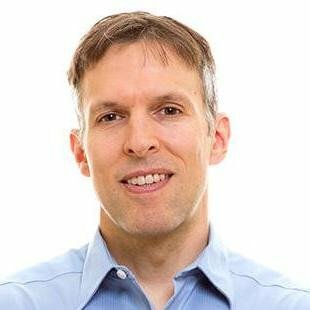 Accepted into Senior Scholar program to create my own ecommerce site. Worked for the student paper illustrating articles. Favorite area of study: Online layout design. You can still write a great graphic design resume education section even if you haven't finished college yet. Just focus on your areas of passion, interest, and accomplishments so far. Accepted to Senior Achiever program to build my own Saas graphic design WebApp. Illustrate articles weekly for the student paper. Favorite area of study: App wireframe design. 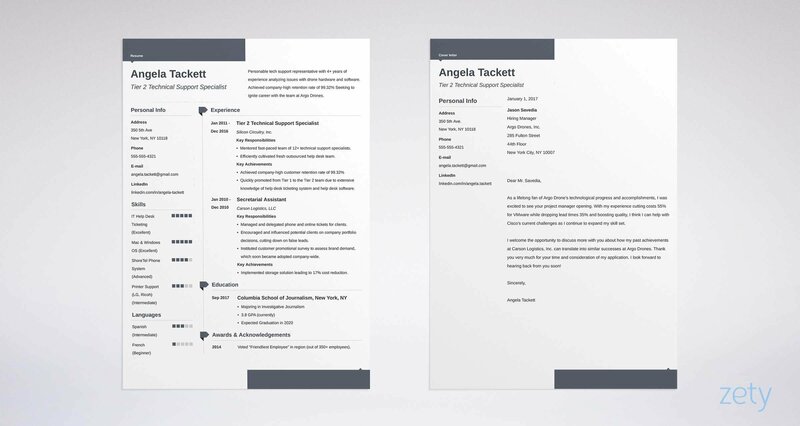 Pro Tip: Create a few graphic design resume templates and keep them on hand. Swap out education details as needed to fit each new job opening. Let’s go back to our art director, Alice. She’s in her office. She’s going through a stack of enough graphic artist resumes to wallpaper the Empire State Building. Yours is in there somewhere, but she’ll never see it. Because you didn’t match your skills to fit the job description. Her automated screening software didn’t even put it in her inbox. Get to know the job description for the position you’re applying to. Let’s say it values Illustrator, Outlook, communication skills, and signage branding. If you’ve got those skills, showcase them. Excellent communicator. Frequently worked on large teams. Excellent research skills. Frequently handled big research jobs. Award-winning signage and branding skills. Award-winning layout skills. Skilled in Illustrator and CorelDraw. Skilled in Acrobat and FreeHand. Use MS Outlook daily. Award-winning layout skills. Again, we’re trying to fit you to the job like it was drawn on. Knowing how to make a creative resume means meeting rigid constraints creatively. Need some inspiration for the best graphic design resume skills section? The best place to look is the job description. For a basic collection, see the list below. You want your resume to showcase your awesome design skills. But you need it to play well with the automated screening systems. Wisely, you back away from the idea of printing your resume on a frisbee or a yoga ball. Instead, you make it eye-friendly and easy to read, then point it to examples of your work online. App design. Designed the flow of the MealDecider App to ensure smooth, eye-friendly navigation through various screens. Web design. Redesigned the website for BikeTripNow.com to create an easy user experience and elevate the brand. Product packaging design. Designed packaging line for Javacat brand coffees. Need some resume design inspiration? Do a Google search for “graphic designer portfolios.” With a little effort, you can stand out like Paul Rand. You want the art director to say those words when she sees your resume. She won’t if it’s like all the others. How do you make it different? Add a section to your cool graphic designer resume that spotlights your best features. Make sure the things you list highlight your ability to do this job. You can add certifications, conferences, publications, clubs you belong to, hobbies, or other pertinent details. My chocolate bar design at BillyPatvi.com was written up in a Huffpost article. Even something that seems small to you might pop out to a recruiter, so take the time to brainstorm. As in other sections, match your list items to the job description. Want to beef up your chops? Google “graphic designer awards,” “graphic designer certifications,” and “graphic designer conferences” for ideas to give your resume more heft. Pro Tip: Have a “personal identity.” Use it on your portfolio website, business cards, and LinkedIn profile. You can even put it on your resume. For inspiration, do a search for “personal identity” on Pinterest. You betcha: 45% of recruiters and art directors will skip your resume if it doesn’t have a cover letter. Your graphic design cover letter is your chance to personalize yourself. It’s a highlights reel of the most impressive things that fit you to the job. Mention something you like about the company. Explain how you can help. Led a team of four designers to develop layout, graphic, and production materials while helping clients cut costs by an average of 10%. Recipient of the 2016 Shopify Ecommerce Design award. Managed the efficient use of project budgets in the $3,000–30,000 range. Use these career highlights in your graphic designer resume to drive your achievements home. 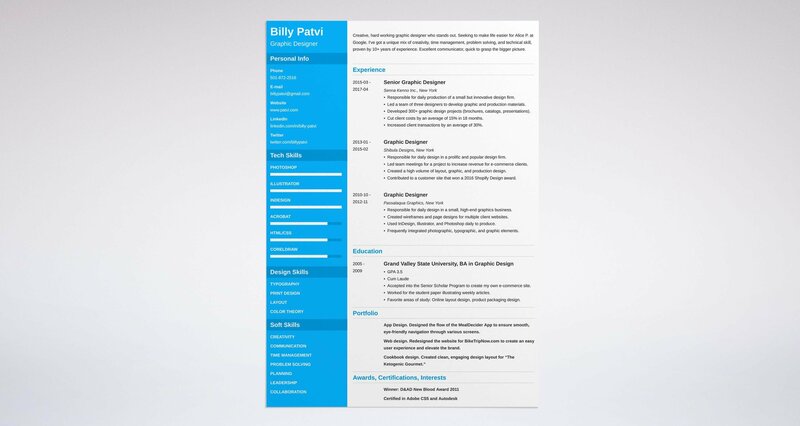 Pro Tip: Search LinkedIn for some good examples of graphic design resumes and cover letter. Pick the best details and use them in your own presentation. While creative resume layouts are fun, it’s better to rely on the standard, reverse-chronological template with excellent content. At the top of your resume, put a well-phrased graphic designer resume objective or summary. Pack your work experience section full of action words that highlight your achievements. Tailor every detail to fit the job offer. Every bullet point should fit the graphic design job description like yoga pants. Do you have any questions on how to make a graphic design resume? Give us a shout in the comments section!